I got excited at this headline in the Stamford Times: "Residents square off in local 'Biggest Loser' competition." 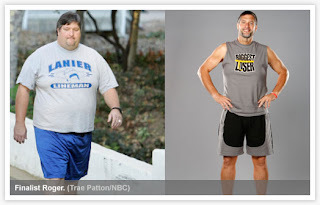 I love the show Biggest Loser, where contestants compete to see who can lose weight the fastest. Watching other people work out is much easier than doing it myself, and it makes me want to exercise more, too. I thought the Times headline meant that people from Stamford would be competing in this season's Biggest Loser, but it turns out that a local gym (actually, a "personal training facility") is running a competition for its members. Ho hum. Unless they are filming it and putting in on local cable access, the news about that gym's competition is useless to me. Yeah, I know that's bitchy to say, but don't throw around the words "Biggest Loser" unless I can live vicariously through it while sitting on my couch. I suppose someone who wants to lose weight, and has 1200 bucks to spend on a 3 month program, would find the article quite useful. The program consists of 3-4 weekly workouts, nutrition discussions, weekly weigh-ins, and other activities, so the money might be worth it if you've got it. This season's real, voyeuristic Biggest Loser starts Sept 16 at 8pm, and this time it's families competing against other families. The drama is intense, man. I feel euphoric thinking about how much I'm going to enjoy watching this season. I am always so proud of how well the people do. Last season was the show's first female winner, Ali, in the photo above. Oh, and look how handsome Roger ended up after he lost 164 pounds. I'm telling you, the show is amazing. It's better than Gossip Girl. What have you done today to make me feel proud? I could not have agreed with you more. That headline was BS. No blog about Antares going under? I know this has been the worst kept secret since last March, but now its official! Interesting! Was the news in the Advocate? I'm not much of a "real estate/development" person- Blog Stamford tends to cover that stuff. I know development in Stamford is an important issue, but I don't find it interesting to blog about, perhaps because the research it requires is boring to me. I'd rather research roosters, immigration, and cricket! I'll see if anything grabs me in the Antares coverage, though. Thanks for the tip!